Since it is a jeep anytime anything can happen ;-) hence I wish I shouldn't stand in the dark night or on a highway without few things. 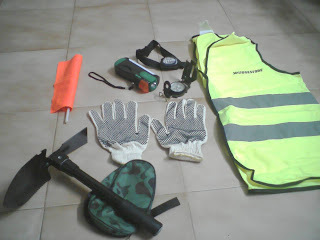 Classified them here, A head strap attached tourch, a blinking flash light, reflective jacket, work glows, a hazard flag and compass. 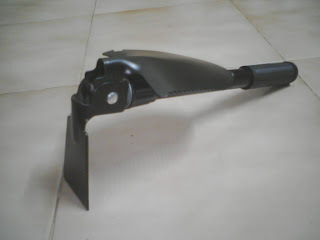 (A GPS device and maps are also found and it will be show cased when I start using them in the jeep as currently I don't find any map suitable for all the land in India) The mini axe and shawl tool is the import from Singapore. 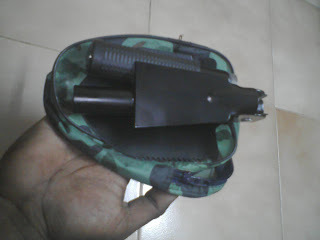 It could be folded and put it on the waist belt with the cover provided. 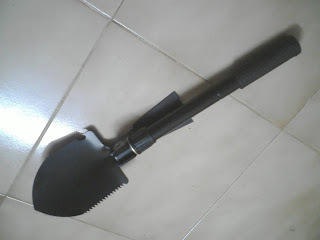 (see the green colored cover under the tool) I found it when I was visiting a trekking accessories supplier. I remembered in my last quarry offroad where I had to switch off the engine due to a hindrance created by a plant with lots of needle like stem. I had to protect myself from the needles while handling the open top jeep with windshield folded. Hence a mini axe and few cutting objects are necessary on offroad ground also a shawl to do something on the ground under the tyre. 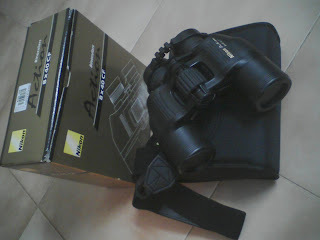 Now comes another thing which I thought I need when I was first floated on the beach sand. I heard my jeep mates saying I should deflate the tyre to get broader surface to float on the sand. I asked myself what happens when I come out of the sand ? will the deflated tyres help me reach my destination, who knows? running the deflated tyre on the hard surface may cause fatal to the tyres. So needed something handy to inflate whenever required. 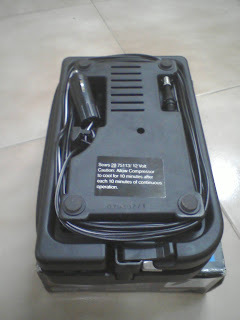 Thus, I asked my friend who was returning from US of A to bring me a good inflator that could work in the jeep's 12v adaptor. 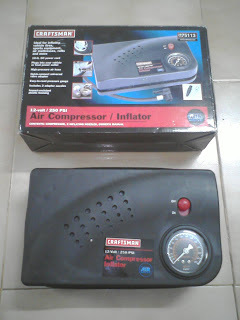 I'm not so fit and confidence to use hand or foot pump to inflate the tyre, so the electrical compact compressor with 250psi capacity. It took around 15mins to fill my empty tyre to fully inflated one. The electrical wire is length enough to pull the box around the 5 wheels in the jeep(including stepney). 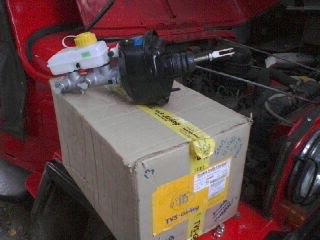 The box is too good as the wire and hose are tied around the compressor box. I still need to buy a hand tow strap with hooks attached (Currently I'm using a heavy steel cable but looking for something lightweight), A highlift Jack, A good strong tool box and A Winch to fill up the whole recovery kit. Hmmm they are big budget grabbers so will take some time to bring them under the jeep's hood. Its been some times since I started observing few issues from the Jeep for settling down. I have categorized them in 3 options and few parts got changed for this categories too. Since the wiper blade was keep on slipping during the rain, I found the factory fitted type milling on the wiper assembly where the Wiper arm connects got issue. Got is replaced with the ones comes with HM Ambassador cars. 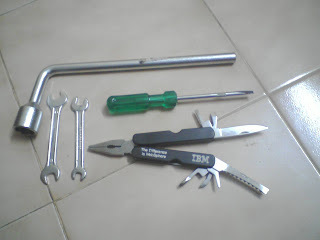 They are screw tightened and gives better grip to the arm. 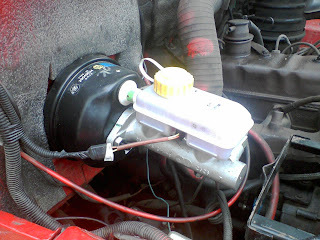 I had issue with the oil circulation pump which comes in the rear side of the alternator which caused oil leak in the air vacuum rubber tube and subsequently spoiled my new break booster. Also noticed oil leak in the break booster MC cylinder stem. 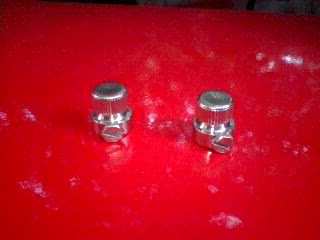 Already my break pedals got stiffer due to this issue, so i have replaced the whole booster kit with a brand new one. 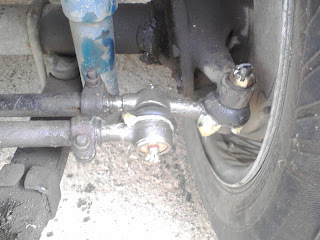 As I have seen the steering play and minor shake while applying break found few issues in the steering as one of the nut was missing and got replaced. The shaky ride during break is due to some issue with the tie-rod ends. 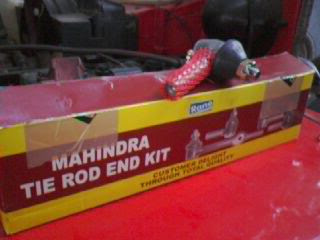 So the original RANE steering tie-rod ends were replaced too.